Editor’s note: Passport to Cheese is Cheese Market News’ feature series exploring the dairy industries of nations around the world. Each month this series takes an in-depth look at various nations/regions’ dairy industries with coverage of key issues affecting them. The nations’ interplay with the United States, including both imports and exports, also is explored. This month we are pleased to introduce Southeast Asia. MADISON, Wis. — Southeast Asia is a “textbook” scenario for growth in dairy demand: Economic expansion, growing populations, developing infrastructure and urbanization, and retail and foodservice modernization all are contributing to a shift in higher dairy product consumption, according to the U.S. Dairy Export Council (USDEC). 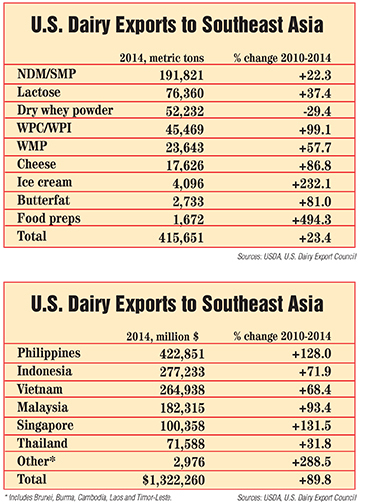 Four countries in Southeast Asia were among the top 10 markets for U.S. dairy products in 2014, according to USDEC. The Philippines was No. 4, and Indonesia, Vietnam and Malaysia were Nos. 7, 8 and 9, respectively. These four countries, along with Singapore and Thailand, currently hold the highest potential for U.S. dairy opportunities in Southeast Asia, USDEC says. The Philippines, for example, produces less than 1 percent of its total annual dairy requirement and imports the balance, according to a Global Agricultural Information Network (GAIN) report released earlier this month by USDA’s Foreign Agricultural Service. The country’s strong economy and growing population of approximately 102 million people in 2015 make the Philippines a large and rapidly-expanding market for milk and milk products. The United States supplies 24 percent of the Philippines’ dairy needs, while New Zealand supplies 30 percent and Australia 7 percent, the GAIN report adds. Southeast Asia is primarily an ingredients market for U.S. exporters, Levitt says. Nonfat dry milk/skim milk powder (NDM/SMP), lactose and dry whey powder are the top three U.S. dairy exports to this region (see chart). In order to be competitive, U.S. suppliers need to fine tune their products to meet the precise needs of their customers. In September, Bangkok was host to Food Ingredients (Fi) Asia, which featured food and beverage ingredient suppliers, distributors and professionals from around the world. Greg Rodriguez, international sales manager for Grassland Dairy Products Inc., Greenwood, Wisconsin, was among the dairy suppliers exhibiting at this show. Among Grassland’s exports are butterfat and protein powders, and the ingredients it exports are used in cheese, nutritional and confectionery industries. Logistics and differences in taste profiles are among the challenges exporters can face in the Southeast Asian market, Rodriguez says. “Cold storage infrastructure can pose a problem in some countries when dealing with cheese and butterfat. It’s important to understand the capabilities of your customers and local importers,” he says, adding that Grassland is beginning to build more relationships with small and mid-sized companies in the region that rely on local importers and distributors. “The taste profiles they want the ingredients and end products to have also can be different,” Rodriguez says. In April, USDEC conducted a trade mission and hosted a U.S. Dairy Business Conference in Singapore that included prominent food and beverage decision-makers from throughout Southeast Asia. As part of that conference, K.J. Burrington, dairy ingredient applications coordinator for the Wisconsin Center for Dairy Research (CDR), gave a presentation focused on using U.S. permeate as an ingredient to help maximize value. Permeate is an ideal ingredient for the Southeast Asian market because in addition to adding value by replacing more expensive ingredients, it also adds minerals and nutritional value to products. It is used in products such as flavored beverage mixes, sweetened condensed milk and confectionery coatings. Next week, CDR will host a group from different food companies in Indonesia who will travel to Madison, Wisconsin, for training in how to use dairy ingredients in their applications. U.S. cheese exports to this region, while not large as dairy powders, have increased significantly over the past several years as the taste for Western foods such as pizza and cheeseburgers has grown. In 2010, U.S. cheese exports to Southeast Asia totaled 9,434 metric tons. In 2014, this amount jumped 87 percent to 17,626 metric tons, USDEC reports. In 2011, Denver-based Leprino Foods, the leading cheese supplier to major pizza chains around the world, opened a business center and Innovation Studio in Singapore to help serve its growing customer base in this region. Skim milk powder, whey powder and fresh cheeses like Mozzarella are all ingredients that U.S. exporters can move easily into Southeast Asia, Dorland says. As global dairy product prices have declined, Southeast Asia has gained more buying power, Dorland says. “The fact that world dairy prices have eased off has given families a greater ability to secure those products,” she says, adding that since prices have come down from highs over the last 12 months, there has been more demand from this region. The United States specifically has seen growth in exports of milk powders and cheeses to this region, she says, though current excess global milk supply also brings challenges from New Zealand, Australia and the European Union. With U.S. butter prices way up this year and surplus powder products in other parts of the world displacing U.S. products, Rodriguez says Grassland has seen lower exports to Southeast Asia this year. However, he says Grassland continues to actively communicate with its customers in the region to let them know that if at any time they need a product, the company is prepared to meet their needs. Dorland says despite pricing challenges in 2015, future opportunities in Southeast Asia look bright for U.S. dairy exporters. “Long-term, I think it is a positive story,” she says. “We’re not fighting over a share that’s not growing, but a pie that’s getting bigger. If it grows and gets larger, we benefit from that. But for now, the competition’s going to be tough."